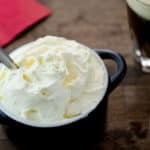 Whipped Cream is such a versatile recipe to have around for Drinks, Desserts and the like but you won't find many (if any) Low-Carb and Sugar-Free versions in the store. It's Easy to make & "So Delicious" who doesn't love whipped cream? Take a hand mixer and begin to whip the cream on a slow setting, you can bring the speed up to medium if you think it won't spray the cream everywhere.